Brands shape our future. A nexus of cultural expression, they sell the “new” and explore the “latest”, whether it is with innovation in advertising or invention in product design. We are constantly delighted by their understanding of what we want now and more importantly, what we will need tomorrow. We covet our brands’ connection with the future. Apple constantly pivots off the notion of “futuristic optimism”, Nike is obsessive in the drive for “performance innovation“ and The North F ace, with a single mind, encourages us to “step into the unknown”. Whilst we consciously connect with these brands because they have one foot very firmly in the future, what is less obvious but no less powerful is that we connect to these brands because they also have one foot rooted in the past. We connect with brands today in the same way the Greeks and Romans connected with their gods. Yesterday’s gods seduced the plebeians in the same way as today’s brands entice consumers. 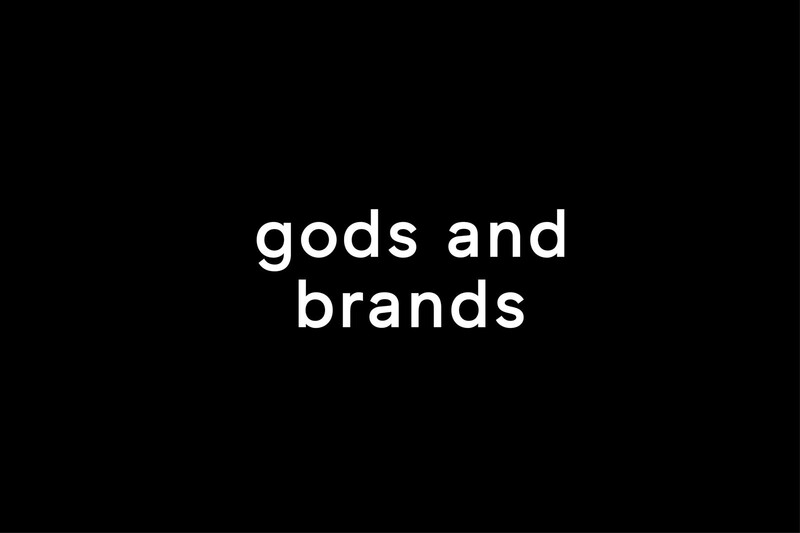 The reason is simple: both the gods and brands are archetypes and we respond to them very powerfully. Proof for this can be found in of all places, Hollywood. One of the most enigmatic archetypes in Greek mythology is Chiron. Half-man, half-horse, he had all the intellects of a human and all the instincts of an animal. Spiritually, he wandered the wilderness and honed his warrior skills. He found and tutored young apprentices who became the finest warriors the world had ever seen, such as Achilles and Hercules. Chiron is “The Guide” archetype. Today in Hollywood we recognise him as Al Pacino in Any Given Sunday, Gandalf in Lord of the Rings or most famously Obi-Wan Kenobi in Star Wars. It is no accident that two of the world’s most successful film franchises use the “Guide” archetype. Jackson and Lucas understood that consumers of the 20th century would respond to the “Guide” archetype in much the same way as consumers did before Christ (yet another guide archetype). It is exactly the same with brands. The connections become clearer when you compare archetypal behaviour with brand behaviour. Take Prometheus. Prometheus was the archetypal rebel that confronted Zeus, who represented the Gods. His establishment did not want to give humanity fire to survive. Prometheus defied the establishment and stood up for humanity and gave us fire. He rebelled against the establishment in defence of civilisation. Prometheus was the ultimate rebel. Like Steve jobs, he defied the establishment to give society what it needed. Steve Jobs and Apple are archetypally Promethean. Firstly, they defied the PC establishment represented by IBM to give us the Apple Macintosh. They also defied the software establishment in Microsoft to give us integrated hardware and software. Next they defied the entertainment establishment like Sony to give us the iPod. Then it was the music industry’s turn where they gave us iTunes. Finally, Jobs and Apple defied just about every one to give us a tablet. We love Apple, one because they connect us to the future but two because their behaviour resonates down the ages. Another archetype is the Greek goddess of victory. She represents transformation through victory and individual glory. Worship her and you will stop at nothing to win. If this sounds familiar, it is – her name is Nike. You can’t get more blatant than borrowing the archetype’s name for your brand. Alas, that is just what Phil Knight did and it has shaped the behaviour of the Nike brand ever since. The big player in the ‘70s was Adidas. Adidas was, and is, the epitome of the Corinthian spirit – taking part is what counts. Is it a coincidence that Phil Knight understood that Adidas was all about the team and the taking part? Is it a leap of logic to suggest archetypes may have affected his desire to differentiate his new brand? Knight fashioned an alternative based on victory and individual glory. The rest is history; we loved it and for a long time couldn’t get enough. Think about it – it’s why Adidas sponsors Real Madrid whereas Nike has Ronaldo. This is archetype at its clearest. Odysseus is the traveller. His journey was the Odyssey, the voyage and the adventure. Leaving his wife, he travelled far from home to fight in the Trojan wars. His return was an epic adventure of distance, trial, monsters, temptation and war. It was the ultimate test of intellect and instinct, endeavour and endurance. There is one brand that has become the benchmark for endurance performance, one brand that pits the human against the forces of nature. This is the brand that celebrates those of us who push the limits of human endeavour. Ring any bells yet? This is the brand that encourages us to “Never stop exploring”. The North F ace is the Odyssean archetype of our time. We love it because The North F ace connects us to our future potential whilst reminding us of the behaviour of the gods. Hephaestus is the craftsman archetype. He used only the best materials and employed supreme craftsmanship to hone the finest weapons known to mankind. His weapons became more than functional objects – they symbolized the warrior’s prowess, his standing and his place. One brand today embodies the behaviour of Hephaestus the craftsman. Using the world’s finest leathers and construction techniques, this brand scours the world for artisans who create functional objects that transcend product performance and become symbols of their owner’s status. Louis Vuitton is the modern day Hephaestus. It morphs functional luggage into totems of aspiration and desire. The archetype analysis also begs the question as to whether we connect in the same way to products. The answer is emphatic. The MacBook Pro is both a creative tool of our age but also appeals to our Promethean rebel spirit. The Air force 1 both defines our cultural position and at the same time expresses our aspirations for individuality. The Summit Jacket is the definitive outdoor performance jacket whilst also seducing us with the promise of an Odyssean adventure. Finally, the Monogram Tote is a beacon of modern style and at the same time appealing to our need for Hephaestian craftsmanship. Our connection to brands is as strong as our forebear’s connection to their gods. The common denominator is that the most successful are archetypes.